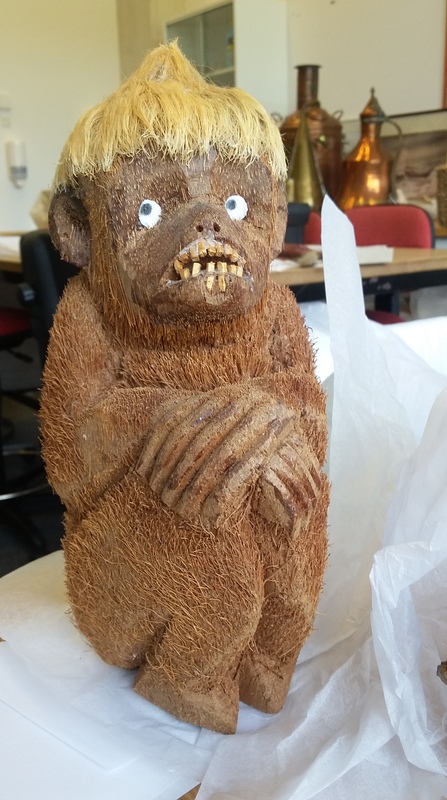 The curious little coconut monkey figure is a part of collection that Mogens Stryhn just handed over to Moesgaard Museum a few weeks ago. As such, it has entered the museum database as EA 909-127. The entire collection consists of 269 artefacts that Stryhn has collected over a period of 60 years all around the world – including Namibia, where the coconut monkey is from. Stryhn, by the way, also handed over more than a thousand ‘ethnographic photographs’, which were his main focus while travelling. His artefact collection, however, also caught the interest of the curator (me), when visiting Stryhn in his home in Aars in 2013. The collection includes old and rare objects alongside objects that can be labelled ‘tourist art’ – of the type that doesn’t ruin anybody. The combination intrigues me. There are beautifully chiselled bracelets from Tibet, women’s headgear from the Kalasha tribe in North West Pakistan, traditional food boxes from Thailand and so on. All of it objects that have caught the attention of the traveller with the camera and regarded valuable enough to bring home. We have several other collections of this type, where it is not scientific arguments that support the collecting strategy, but simple a fascination of things encountered.